Will Supreme Court decisions let Bruno off the hook? 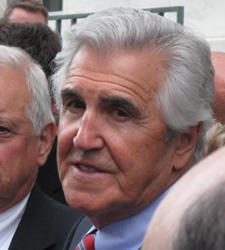 The Supreme Court of the United State issued decisions today in three cases (1, 2, 3) involving the "theft of honest services" law -- the law used to convict Joe Bruno. + Should the "Joe" name go? Of course they don't. The Feds hit Bruno as hard as they reasonably could with the tools at hand. It was a signal, a generational line being drawn. When whoever writes Kambrich's stories adds "exonerate?" she'll be erasing the signal a little, and that's the wrong takeaway for viewers. So here it is, unsweetened. Influence peddling isn't a perk that civil servants accrue and senior ones cashier, not any more. The last guy got off because he was eighty. You won't. Probably. Maybe. Well, don't count on it, bub.